Download SoClean CPAP Compatible List.pdf. AllegroMedical.com introduces the SoClean® 2 CPAP Cleaner and Sanitizer, an automated CPAP equipment cleaner and sanitizer. Are you doing everything you can to keep your CPAP clean and prevent infectious diseases like pneumonia and the flu? 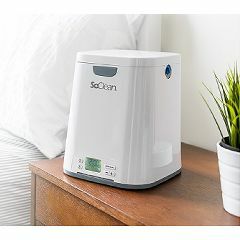 With the SoClean 2 CPAP cleaning machine, you can sanitize and disinfect your CPAP mask, hose and reservoir without needing to take any pieces apart every day. The machine does not require water or any messy chemicals in order to avoid condensation and ensure your equipment remains completely dry. The inside chamber was designed specifically so multiple mask types can be used within the SoClean CPAP cleaning unit, from nasal pillow masks to full CPAP masks. All you need to do is wake up and place your mask directly in the SoClean CPAP cleaning unit. You don't even need to disconnect the hose. What is included in the SoClean® 2? What are the features of the SoClean® 2? What are the benefits of the SoClean® 2? Who should use the SoClean® 2? If you find that you’re getting sick more than usual, a dirty CPAP could be the culprit. That’s because CPAP equipment is a breeding ground for bacteria and germs. Individuals who have weakened immune systems or are susceptible to infectious diseases. Anyone looking for a faster, easier, more effective, way to clean CPAP equipment. Is my CPAP mask compatible with the SoClean® 2? Most CPAP machines with a standard hose will work with the SoClean right out of the box. Some CPAP machines may need a specific adapter, particularly units with a heated hose. View the attached PDF of compatible units to see if your machine needs the specific adapter. If you have a ResMed S9, ResMed AirSense 10, Philips Respironics, Fisher & Paykel ICON, Fisher & Paykel 600 or Transcend/Z1, you will need to purchase a special adapter for the SoClean to be compatible. Are there supplies that have to be changed with SoClean? Yes, every six months of normal use, the filter and check valve need to be changed. The filter and check valve come together in a kit and can be ordered at this link.